Italian for flavour. Made from Mediterranean garlic. Recommended by the food masters.Gia Garlic is produced to a unique formula based on an authentic Italian recipe. Careful handling retains the full fragrance and unique taste of garlic. Use Gia garlic and save yourself the fiddle and mess of skinning and crushing cloves of garlic. 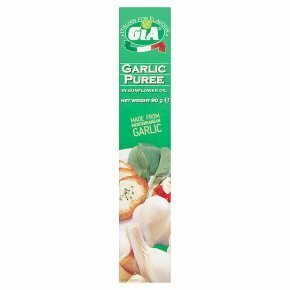 Gia garlic puree can be used in all recipes which call for garlic-such as garlic bread, sauces, roast meat stews casseroles.